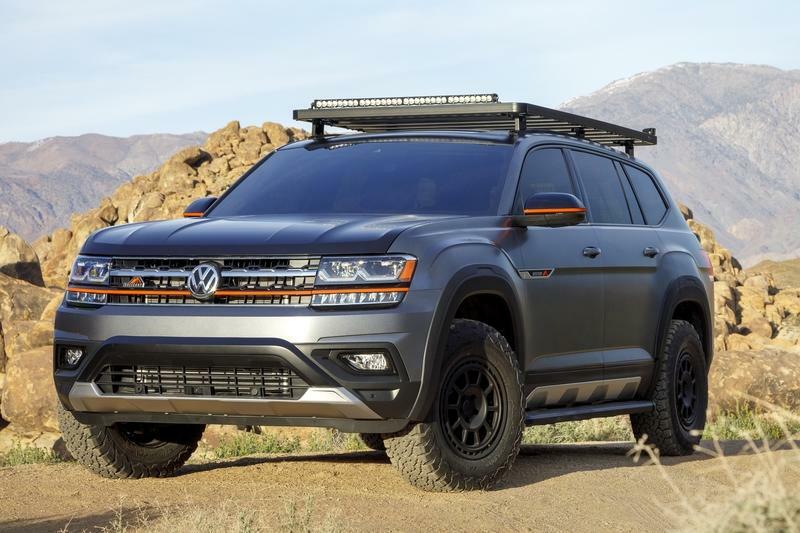 The Volkswagen Atlas Basecamp Concept is a concept only in name. It’s not like the Atlas Tanoak Concept, a hastily produced pickup concept that could find its way in the market soon. The Atlas Basecamp, on the other hand, is an interpretation — an interesting one, at that — of a model that’s already out in the market. The Atlas Basecamp started its life as a not-so-humble, family hauling Atlas SEL Premium, otherwise known as the range-topping version of the SUV that’s available in the U.S. market. It figures that Volkswagen would choose the SEL Premium trim to showcase the Atlas’ would-be off-road chops; it wouldn’t make sense to do it in any other trim. Visually, there’s not much difference in the way the Atlas Basecamp looks compared to the standard Atlas SEL Premium. All the design elements remain where they are throughout the SUV’s body. 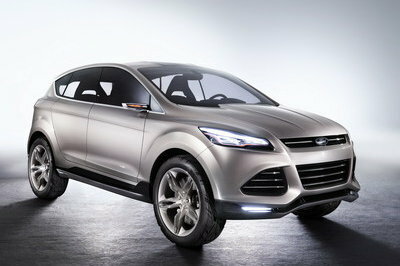 The most notable change, in fact, is the color of the concept SUV. Whereas the Atlas SEL Premium is available in eight different colors — Fortana Red Metallic and Terra Brown Metallic are two of my favorites — Volkswagen switched things up with the concept, dressing up the Basecamp in a matte-finished Platinum Gray color. For the record, Platinum Gray is available as a standard color on the Atlas SEL Premium, but it’s available in a metallic finish. The matte finish of the Atlas Basecamp gives it a more understated look and the accompanying orange accents throughout the body, specifically in the front grille and mirror caps, provide a nice splash of color. The Atlas Basecamp also wears a body kit courtesy of Air Design. The kit, though, is a bit understated compared to what we’re used to when we hear the term “body kit.” Volkswagen didn’t dive into the specifics of the body kit, but based on the photos, the underbody plates and the prominent side skirts are pretty easy to spot. The rear section, in particular, appears to receive more prominent underbody plates than what the standard Atlas SEL Premium is already carrying. Up top, the roof rack with the bike holders is pretty easy to distinguish. Same thing with the LED light bars sitting on opposite ends of the roof rack. They look totally inconspicuous in the day time — you might not even notice them — but they explode in prominence and importance at night when the roads-less-traveled become even trickier to navigate. Perhaps the most prominent upgrade the Atlas Basecamp Concept received is the set of fifteen52 Traverse MX Concept wheels that are wrapped in one of the meatiest all-terrain tires you’ll ever see. 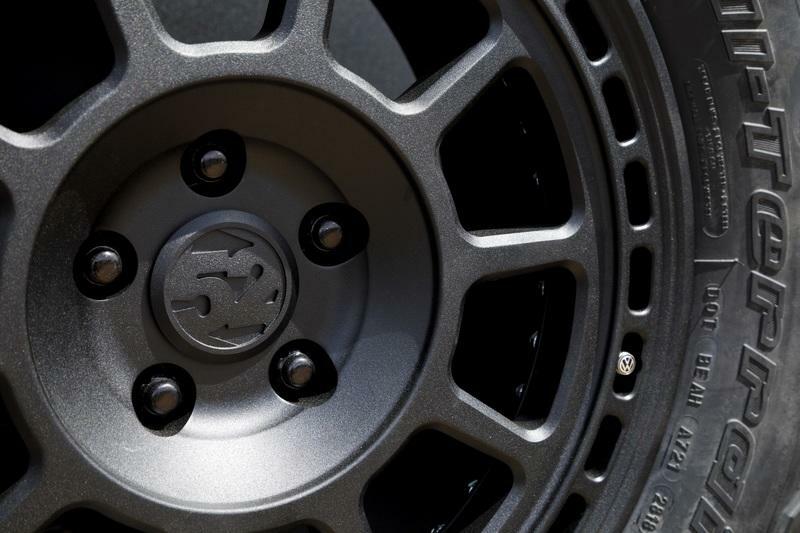 The wheels themselves are concepts courtesy of fifteen52, but unlike the Atlas Basecamp, series production versions are scheduled to arrive sometime in the fall of this year. The wheel-and-tire combination provides the Atlas Basecamp the necessary shoes to tackle uneven paths. The tires, particularly, a larger out of necessity, at least when you consider the kind of go-anywhere identity Volkswagen is trying to establish with the Atlas Basecamp. Larger and wider tires typically have thicker tread, which, in turn, can cut better through water, snow, mud, gravel, or less than stellar road conditions. Obviously, The concept’s off-road capability doesn’t just start and end with a new set of wheels and tires. 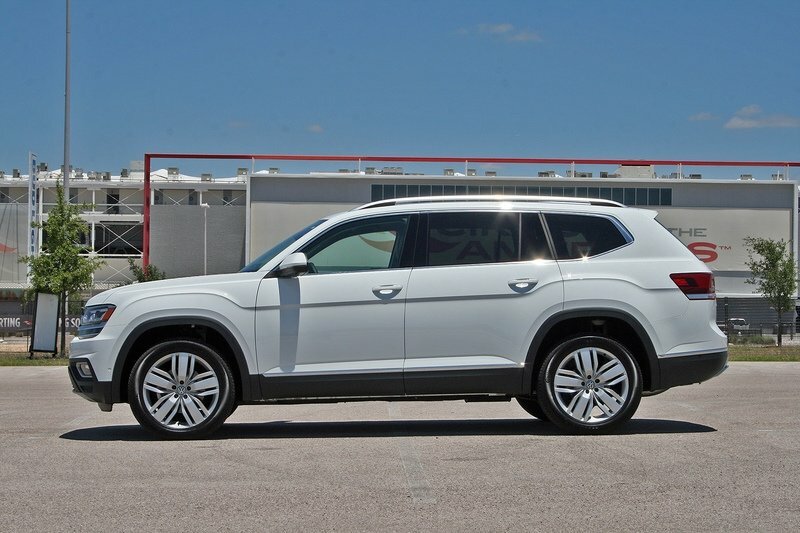 In order to accommodate those massive wheels, Volkswagen also raised the SUV’s ride height by 1.5 inches — from eight inches to a stout 10.5 inches — compared to the standard Atlas. A new lift kit with coil over sprints sourced from noted suspension specialist H&R gets credit for the Atlas Basecamp’s improved ground clearance. 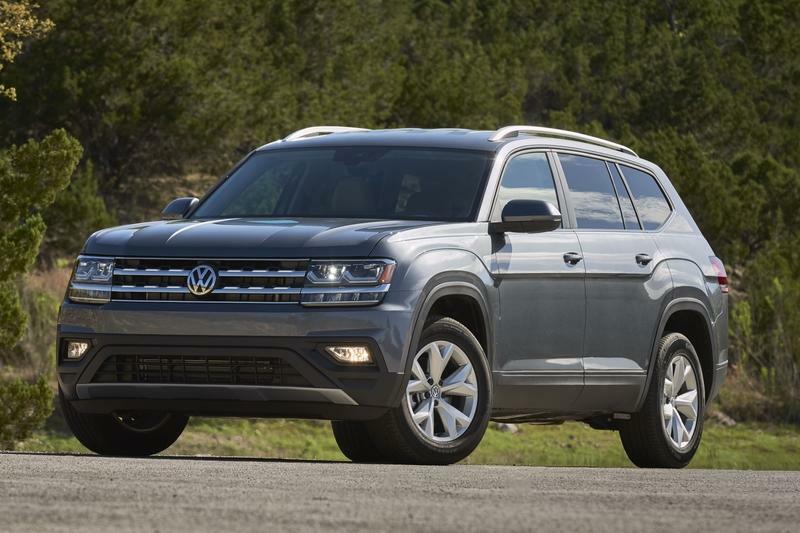 A big part of the Volkswagen Atlas Basecamp Concept’s appeal is the fact that its concept status doesn’t revolve on the Atlas alone. We also need to talk about the Hive EX trailer at the back. Certainly less conspicuous than the astronomy-inclined trailer of the Nissan Navara Dark Sky Concept, the Hive EX is a form-meets-function type of trailer. 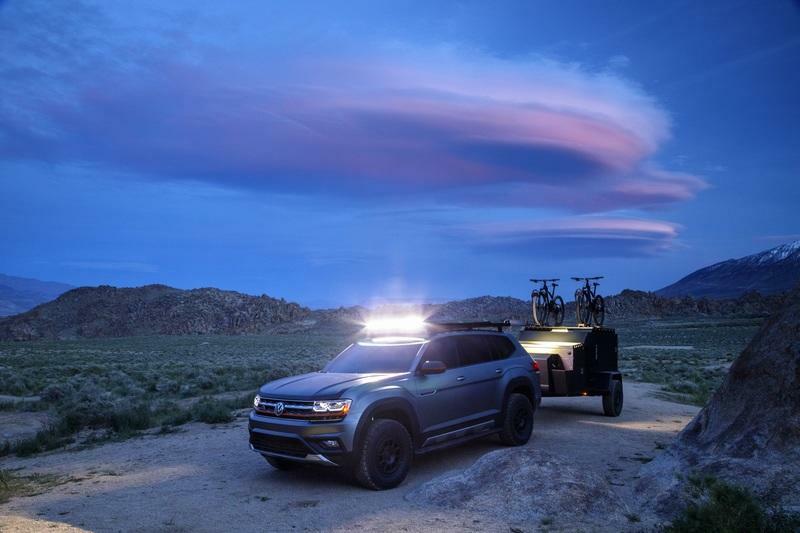 It wears the same wheels and tires as the Atlas Basecamp Concept, but, more importantly, it packs plenty of creature comforts for those nights under the stars. Together, the Atlas Basecamp Concept and the Hive EX trailer make for an ideal tag team out in the wild. It’s not what you’d expect from an SUV that’s pegged as an urban people-hauler, but concepts like this prove that VW’s latest SUV is far more versatile than it’s been letting on. 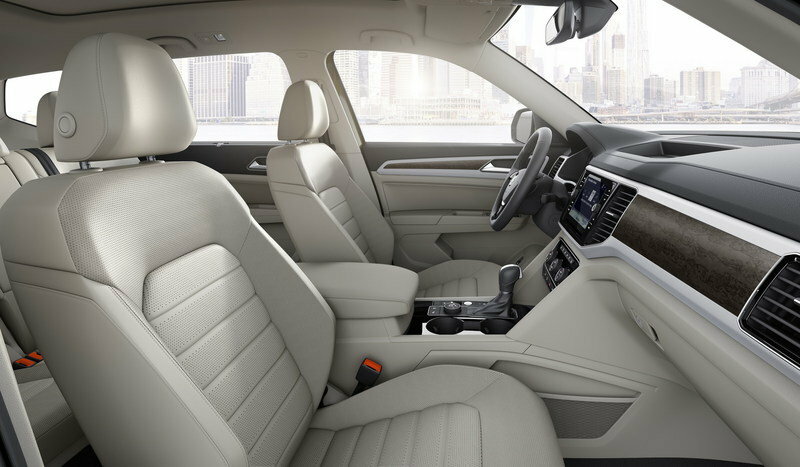 That’s a welcome surprise, for sure, especially for those of you who are in the market for a fresh mid-size, seven-seater SUV. 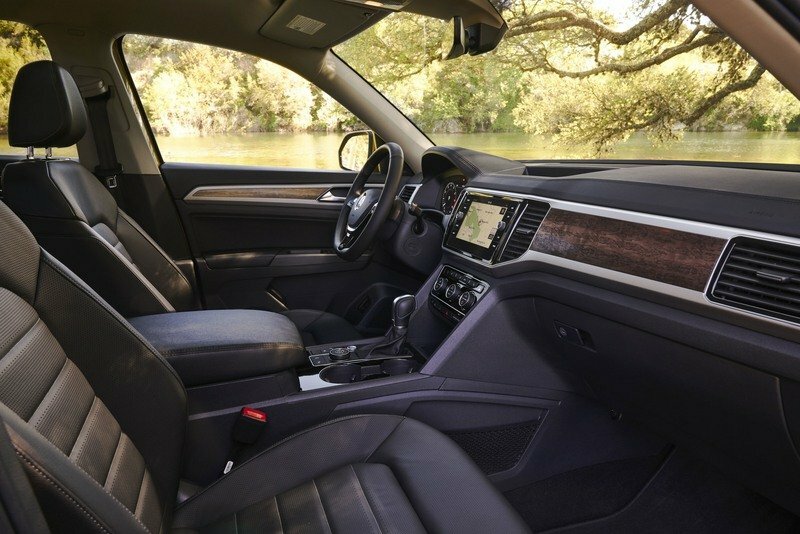 The Volkswagen Atlas Basecamp Concept’s interior doesn’t get as much shine because, well, there aren’t any meaningful upgrades to look forward to. There’s no fancy leather to speak of and no contrast stitching to notice. Best I can tell, even the floor mats remain standard on the concept. Here’s what you need to know about concepts and special edition models: if the floor mats aren’t new or unique, then most of the interior likely retains its standard configuration. The good news is that we are dealing with the Atlas SEL Premium. That means that even without any purposeful upgrades in this section, there is an option to choose from three different leather trims: Golden Oak, Titan Black, and Shetland leather. That comes standard when you buy the top-of-the-line Atlas. Then again, only Golden Oak leather and Titan Black leather are available on a Platinum Gray Atlas. Seems like you’re going to have to navigate this section of the customization options for you to strike the right color balance between the exterior and interior of the SUV. For the most part, though, the Atlas Basecamp Concept doesn’t feature any significant interior upgrades. It’d be disappointing if we’re only talking about the SUV itself, but given that it’s towing a state of the art trailer, we can turn our attention to that instead because it more than makes up for what the SUV’s interior lacks. For the record, I’m a big fan of the Hive EX trailer, mostly because it looks like a chopped up Hummer H2 without of any of the ostentatiousness of the departed SUV. The trailer’s a bit boxy, but at least it doesn’t scream for the attention the way the Navara Dark Sky Concept’s trailer does. I like the black minimalist look. There’s something appealing about an understated package that conceals a decked out interior. That’s certainly the case here. The Hive EX features plenty of creature comforts that you’re going to need for those nights you plan to spend under the stars. It doesn’t feature a state-of-the-art Planewave telescope like the trailer in the Navara Dark Sky Concept, but it does have a pullout canopy, a stove, sink, freezer, refrigerator, propane tank, portable toilet, shower, removable leveling jacks, a propane tank, and, most importantly, a queen-sized bed. Now, I’m not going to judge any of you for your choice of accommodations in the outdoors, but give me a queen-size bed, a shower, and a portable toilet over hammocks any day. The propane-powered stove is awesome, too. At least I can take comfort knowing that I’m not too far away from cup noodles or a medium-rare steak in the event I start craving for either. Or maybe both. At the same time. Don’t judge me. You’re probably wondering, too, how all of this equipment can fit inside the trailer. Well, the short answer is not all of the equipment are found inside the living space of the trailer. Some, like the stove, sink, and freezer, can be accessed through a compartment on the front end of the trailer. Likewise, a counter can be pulled down from a separate compartment on the back end of the trailer. I don’t expect the shower head and the portable toilet to be inside the Hive EX, too. Set your expectations low for this section. Actually, don’t set any expectations at all. 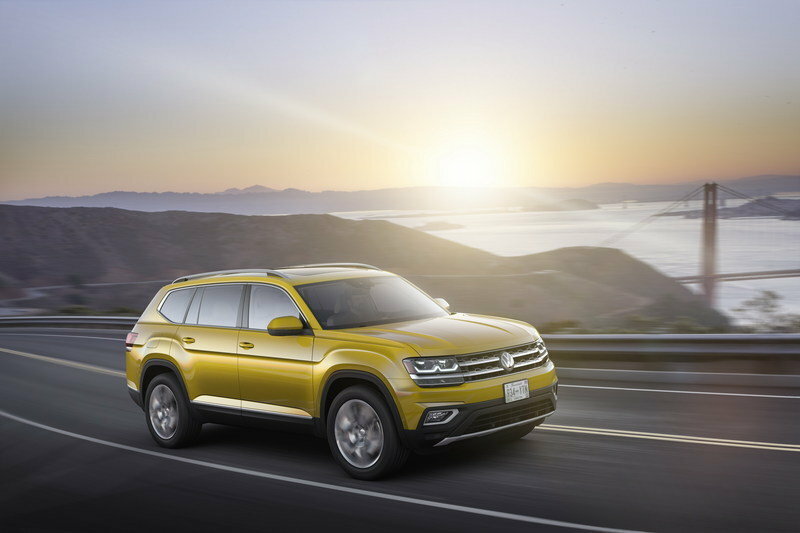 The Volkswagen Atlas Basecamp Concept is powered by the same 3.6-liter V-6 engine as the Atlas SEL Premium. 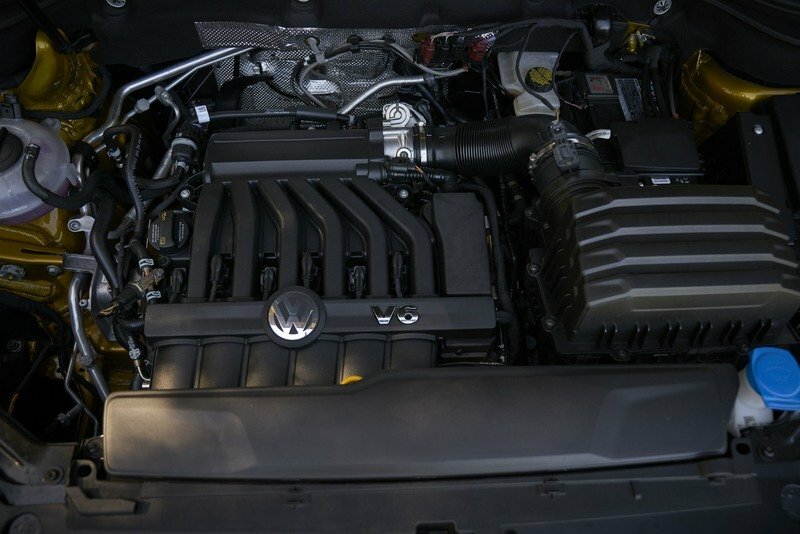 There are no special tricks that boost up the output of the engine. What you get on the Atlas SEL Premium is 276 horsepower and 266 pound-feet of torque output as the Atlas SEL Premium. An eight-speed automatic transmission comes standard, and that’s responsible for sending power to all four wheels of the SUV. That’s what the Volkswagen Atlas SEL Premium’s brochure will tell you. 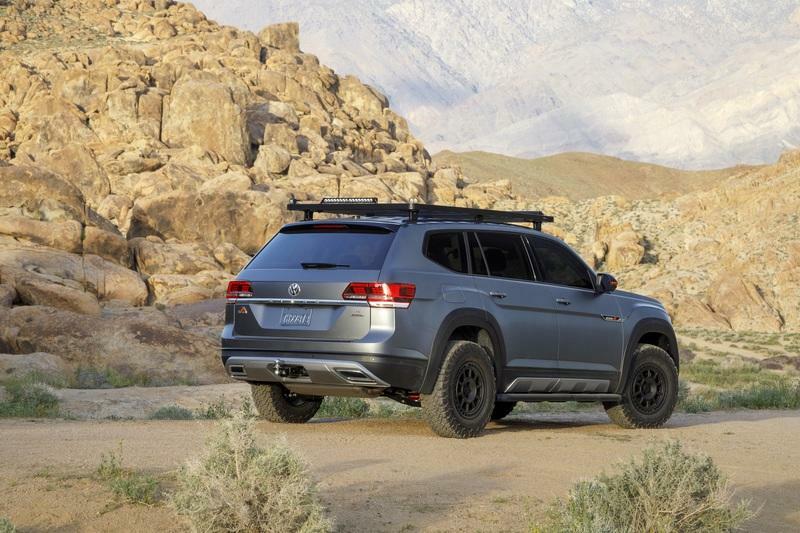 What it won’t say is that you’re probably not getting the same amount of power and torque out of that V-6 engine when it comes to the Atlas Basecamp Concept. Between the raised height, the bigger tires, and the fact that it’s hauling a Hive EX trailer, the Atlas Basecamp Concept’s V-6 engine can probably produce somewhere closer to 250 horsepower and 240 pound-feet of torque. I don’t have the exact figures because, a) Volkswagen didn’t divulge the concept’s power figures, and b) because I’m not a scientist. 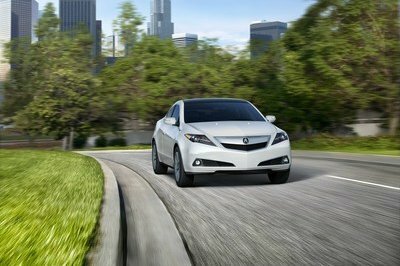 What I can tell you is that heavier wheels and tires, among other things, means less power realized against the road. If the Atlas Basecamp is wearing bigger tires, that’s going to have an effect of the amount of power that the wheels will receive from the V-6 engine, though not necessarily from the powertrain itself. Does less realized power make a big difference out in the real world? It does in some cases, but if you understand where you’re going and what you plan to do when you get there, it shouldn’t have that much of an effect on the SUV’s performance capabilities. The good news is that the Atlas Basecamp Concept doesn’t seem to have any problems hauling the Hive EX trailer around. Best I can tell, the trailer weighs somewhere around 2,000 pounds, so, at the very least, we know that the Atlas’ max towing capacity of 5,000 pounds is being put to good use. The Volkswagen Atlas Basecamp Concept isn’t going to blow the roof off the Jacob Javits Convention Center. It might not even make a Top 5 list of best debuts at the 2019 New York International Auto Show. 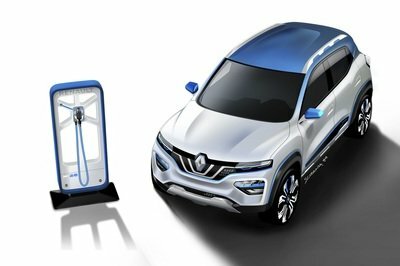 The concept SUV will show up, smile for the cameras, and book its next appearance at the 2019 SEMA Auto Show later this year. It won’t wow anyone, but if you think that it will, then you’re missing the point of the concept entirely. 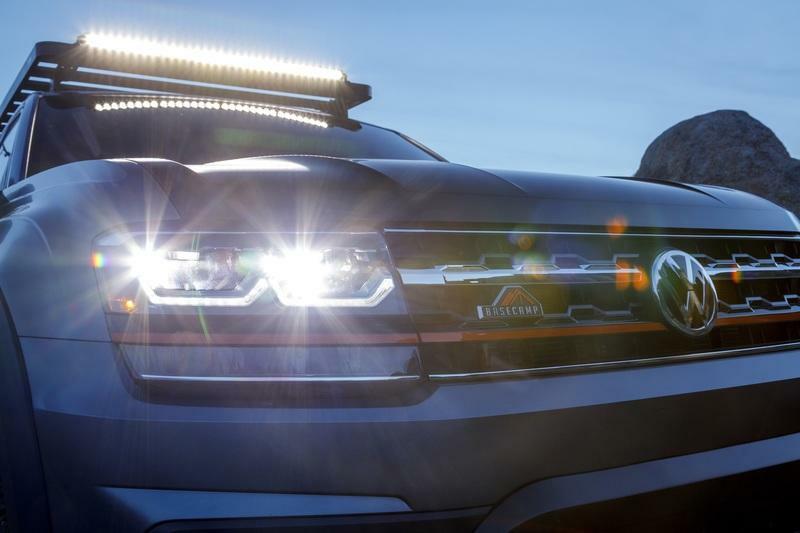 Volkswagen isn’t bringing the Atlas Basecamp to New York so people can fawn all over it. It’s bringing the concept to the show for the purpose of showing everyone that the Atlas is not a one-trick SUV. 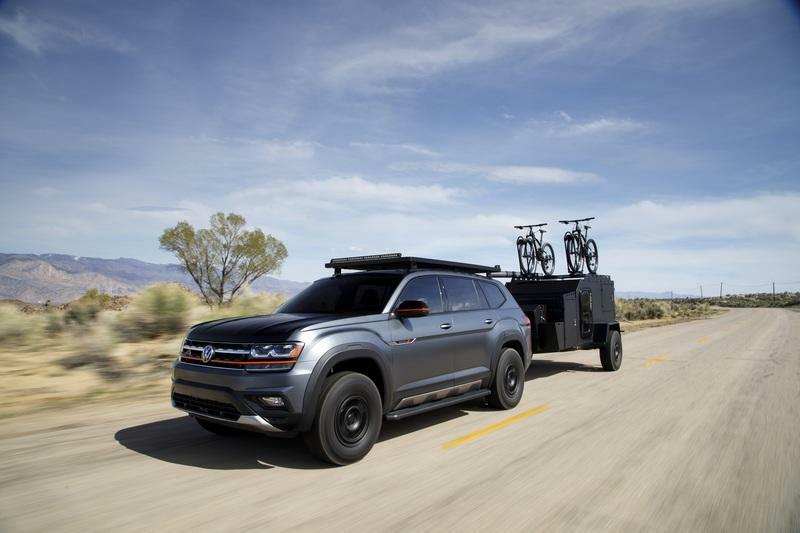 Like most vehicles in its segment, there are layers to what the Atlas is capable of, provided that you know and understand what you want to do with it. 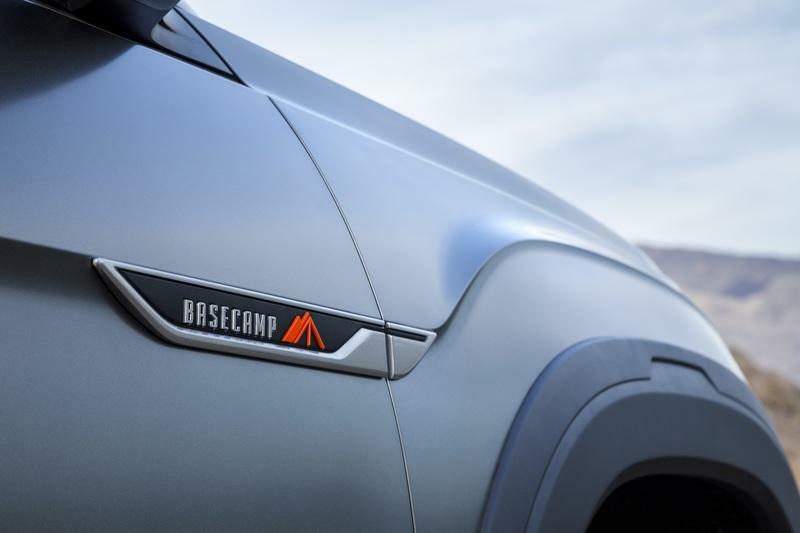 The Basecamp is one example of what VW’s new SUV can become. 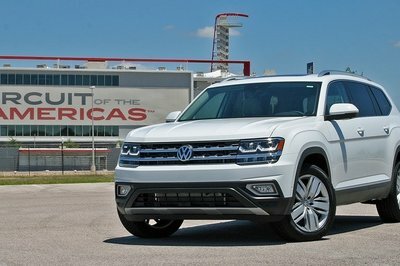 I like that Volkswagen’s showing off the Atlas’ rugged and outdoorsy personality. 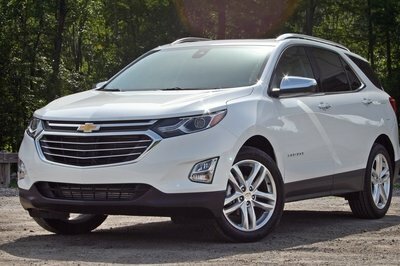 It shows that even if It’s a mid-size SUV on paper, with the right equipment and the right goal in mind, it’s capable of far more than just your daily errand ride.